So you picked up GMT’s Space Empires designed by Jim Krohn and hope to dive into this most excellent game.. Good, I am here to let you know about my experiences with this box of 4x fun. COMPONENT REVIEW: GMT always makes excellently cut counters and has great printing quality.The Board is Mounted, the player aids are of thick cardstock and the counters are a perfect thickness. ( KEEP IN MIND THE 2ND PRINTING HAD THICKER CUT COUNTERS DUE TO COMPLAINTS ON THE FIRST PRINT RUN). Each player color has their own ship graphic designs on the counters which lends to the space exploration/combat theme. Space Empires also comes with a pad of paper which each player will track their expenditures as well as ship upgrades and technologies researched on. 8/10 score. RULEBOOK AND LEARNING CURVE : The rules are laid out nicely in a full color rules manual and a separate book called the play book houses the various scenarios and also gives you several solo game options which are quite fun on their own right. Learning curve gradually builds as you play the game adding various optional rules at you disposal. 8/10 rules. GAMEPLAY : Space Empires gives me the feel of an older computer style RTS game. You start the game with a small fleet of Scout ships and a ship yard to start your small civilizations. Slowly you explore the uncharted star systems in you own safer quadrant of space. Once you start to populate your nice starting area you can begin to expand into the more dangerous Deep Space. The beginning of the game is exciting with everyone exploring and creating what they think will be the ultimate space fleet, all counters are flipped face down to simulate fog of war. As the game progresses you will send you ships out closer to other player zones and things will come close to the brink of war. Minerals will become sought after and enemies other than the players will appear. You choices of technology will begin to matter as things escalate into chaos. Combat is a simple rolling of ten sided dice which are then modified by ship upgrades of the attacker and defender. This game can have some massive combats involving many many ships. All players have a good time watching the outcomes of these massive battles and hope both players take many casualties. Your empire will record all tech’s on a sheet hidden from all players and you will surprise those enemies with how you have built your ships when it comes to battle. Depending on how players approach this type of game can have an impact on length. What I like about it is whoever kills the first home planet of any player is the WINNER. That being said a player who turtles his empire may just as well lose due to the fact that the neighbor to him was very aggressive and did not need to worry about the defensive player. I must say this game is heavy on bookeeping, writing you funds, checking off technologies, keeping track of what ships have the newer ship up grades ect. Those that I played with did not seem to mind this and is a different approach to games we normally play. Just think of it like Eclipse without the fiddly cube/disc movement. 9/10 gameplay. FINAL THOUGHTS : Ok so I feel this game gives some of the most nail biting and tense moments in a 4x game. Why you ask? I think it is because of the hidden information mostly. I like the fact that I have no idea what kind of ships my opponent has in that stack of chits. If I do know then what kind of up grades does he have? Should I send my killer stack of ships in not knowing that he has space mines there? There is a great feel of Exploration here and there is enough variety to give that feeling of excitement and dread every time when exploring. Game is great with 1,2 and 4 players. With three the game can drag in length a little bit but is still ok. I like the economic engine in ECLIPSE, the political intrigue in TWILIGHT IMPERIUM 3RD EDITION and I love the empire book keeping and straight up dice rolling combat in SPACE EMPIRES, a great game to own and fun to play. 9/10 game score. So, I’m minding my business, playing a solo scenario of Space Empires 4X, trying to expand and explore when I start to hear a clock of Doom ticking on my score sheet. That ticking noise signaled the deliberate and terrible encroachment of 3 Doomsday Machines coming from the deepest reaches of my hexagon space directly at my most vulnerable Colonies. I anticipated that I had two or three turns to build ships and get them out to my little baby Colonies, only one of which had a defensive Base structure. Meanwhile, I also had to make decisions on bringing back some of my Destroyers and Cruisers that were foraging through the vacuum of space for new habitable planets, minerals and derelict ships (that can provide small boons in tech). Long story short–I wound up losing most of my colonies and over a dozen ships, but the defensive Base stations along with a small squadron of Raiders was able to outlast these appropriately foreboding entities. I came out of it beat up, licking wounds (however that would look with ships in space…yuck and brrrr!! ), and exhilarated. Many have used the word “elegant”, and I will concur. The rules are seamless and modular–you can pick and choose what you want in and out. I highly recommend going with GMT’s 20+ years proven rules to start. The board is flexible. Not literally, of course, but besides the colored borders there are also dotted lines that allow for different start up configurations for 1-4 players. The graphics are retro and unique from race to race. The heavy cardboard feels durable (certainly time will tell). There is a “spreadsheet” like component that makes a lot of sense and actually helps move the game along. It looks a little scary at first, but it helped a lot to keep my numbers, ships and tech advancements in order. There’s a nice balance between adhering to the stats of each ship’s attack and defensive characteristics versus the “role” that luck plays by rolling 10-sided dice to decide certain outcomes. Because of the flexible nature of the game I’ve added more elements of good and bad luck when it comes to certain mysterious “Danger!” tiles. You do have to read the rules a couple of times, and there are few game play demos on YouTube. There was one bearded and pipe-smoking gent named Calandale (http://www.youtube.com/watch?v=nnxPEaKU53M) who was fairly helpful. I recommend you viewing him to get a feel for play. Additionally, I think the 60% survival rate of escaping a black hole is very generous (thus I’ve modded that through house rules). There’s also an aforementioned “Danger!” tile that usually equates to instant death according to the standard rules, no matter how powerful your ship or fleet. It’s probably the most abstract element and doesn’t come up often (thank goodness). This element is modular as well, which reflects a great strength and high replay value of the game. I share one such mod/house rule in the Tips section of SE4X. 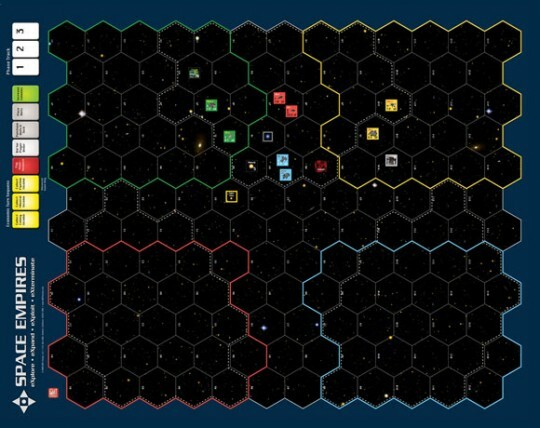 In all, Space Empires 4X is fun, intriguing and challenging as a solo game, and against others. Obviously, the more players-the longer the game, but I didn’t experience any game beyond 45 minutes/player, which is tolerable for me. I bought the expansion (Close Encounters), and can’t wait to integrate those elements soon enough. Enjoy! 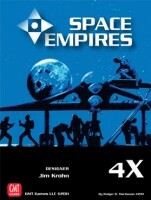 Add a Review for "Space Empires: 4X"